Madonna's attire is easily recognisable and the stage is filled with Pixie Lott's outfits. Image courtesy Ripley's Believe It Or Not! The Hard Rock cafe chain prides itself on its music memorabilia. To celebrate its 45th birthday it's put on an exhibition at Ripley's Believe It Or Not! (the attraction's exclamation mark, not ours). 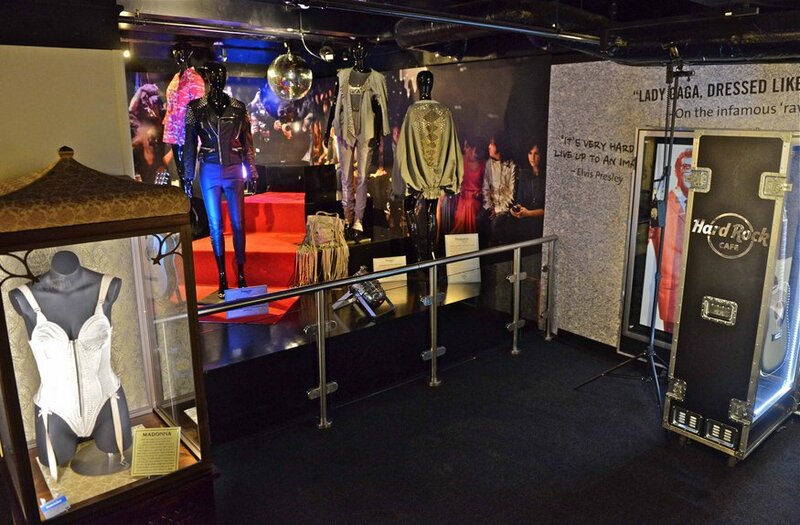 Visitors can have a gander at such items as Eric Clapton's guitar and a gold top worn by Shakira. Think of it as Hollywood Costumes, but smaller. The kick you get out of these items partly depends on what said star means to you, and partly on what the item in question is. So we quite enjoyed seeing one of Johnny Cash's guitars and a suit belonging to Paul McCartney. The many dresses of Pixie Lott and Jimi Hendrix's rather normal looking trousers, however, failed to get our hearts racing. The dichotomy continues with the leather outfit worn by the frontman of The Scorpions — it looks uncomfortably awesome and a complete contrast to the checked shirt worn by Zedd (we had to look him up), which is probably availably on any high street, anywhere. We saw one of Rihanna's less skimpy, though still pretty skimpy, outfits. Its red, yellow and white block pattern is clearly inspired by Mondrian — though we wonder if she knew that. The big problem with this show is that the various togs and gimcrack is such a mish-mash, it's only ever going to partially appeal to fans of music memorabilia. Hard Rock Couture is on at Ripley's Believe It Or Not! until 10 April. Entrance to Ripley's starts at £20.21 for adults, concessions available.